The much publicized claim of graphene as the superb thermal material for the dissipation of PC heat is overstated because conduction is far slower than the prompt emission of QED photons. The BTE and phonon theories do not give unique results and typically rely on adjustable parameters to fit the data. Experiments for single layer graphite (SLG) flakes exfoliated on SiO2 are compared with suspended graphene computed with the BTE and measured conductivity for bulk pyrolytic graphite (PG) in the figure. 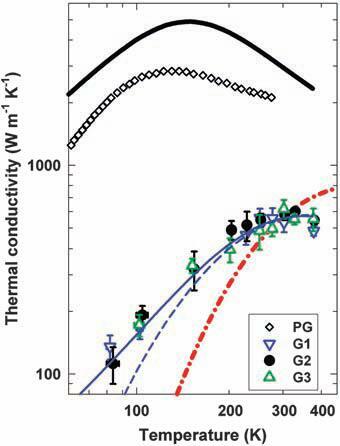 Measured SLG thermal conductivities with reported values of PG are shown with the BTE calculation results of suspended SLG (black solid line). Suspended grapheme shows a peak of about 5000 W/m-K while measured conductivity of PG peaks at about 2000 W/m-K. The supported SLG for 3 sets of adjustable phonon parameters are given by the (blue solid line), (blue dashed line),and (red dashed-dotted line). How one discerns which of the 3 phonon solutions is correct without having the experimental data is not known. Nevertheless, phonon theory as embodied above is considered a crucial first step toward explaining the thermal conductivity of supported graphene. See http://www.sciencemag.org/cgi/reprint/328/5975/185.pdf Complexity aside, phonon theory is always modified to fit experimental data at hand suggesting the desirability of simpler theory to explain supported SLG and thin films in general. One such simpler theory is QED induced radiation. QED stands for quantum electrodynamics. QED radiation relies on the quantum mechanics (QM) argument that the specific heat vanishes at the nanoscale. See http://www.nanoqed.org at “Zero Specific Heat” and “QED Induced Heat Transfer.” By this theory, thin film experiments have been mis-interpreted to date because phonons alone are assumed to be the heat carriers at the nanoscale. Photons conserve absorbed energy far faster than phonons by emitting QED radiation, and therefore heat conduction based on phonons does not even occur at the nanoscale. Hence, any reductions in bulk conductivity in thin films caused by excluding QED radiation in the heat balance are meaningless. Bulk conductivity may therefore be assumed at the nanoscale without any loss in accuracy. Historically, phonons as heat carriers in the solid state began with theories of specific heat based on data at the macroscale. Indeed, Einstein in 1907 formulated his specific heat theory of characteristic vibrations based on data at the macroscale and not the nanoscale. Without clarifiying how atoms may be treated as photons, Einstein assumed atoms as harmonic oscillators at sonic velocities follow Planck’s distribution of photons at the speed of light in a blackbody cavity. In contrast, the modified Einstein theory proposes that photons instead of phonons are the heat carriers in the solid state at both the macro and nanoscale, and except for differences in refractive index are in total agreement with Planck’s photons in an evacuated cavity. At the macroscale, phonons at acoustic frequencies that can respond faster than very long wavelength photons remain the heat carriers. But at the nanoscale, short wavelength photons that can fit in nanostructures respond much faster than acoustic phonons, and therefore promptly conserve absorbed heat before phonons can respond. Hence, photons are the heat carriers at the nanoscale – not phonons. By QED radiation, the experimental results for SLG are not reduced compared to bulk, although are dependent on temperature. Taking PG as representative of bulk SLG, the SLG conductivity is lower bound at 2000 W/m-K at 300K. Similarly, the BTE calculation of suspended graphene is overstated at 5000 W/m-K, and instead remains at the bulk value of 2000 W/m-K. Apparently, PC heat dissipation based on increasing the thermal conductivity of thin films by graphene has not considered the fact that natural convection limits the heat transfer – not the conductivity of the film itself. Indeed, convection controls heat transfer even if the conductivity of graphene were infinite. Therefore, claims of the high conductivity of graphene in future PCs may be misplaced, as thin copper films become just as attractive as graphene. QED radiation avoids the limitation of natural convection on thin film performance because heat absorbed by the graphene is emitted as QED radiation that bypasses convection and is absorbed in the surroundings. 2. QED radiation based on photons as heat carriers is a far simpler theory to explain conductivity of graphene compared to that by phonons. 3. The conservation of absorbed energy in thin films by the absorption of QED emission in the surroundings avoids the limitation of natural convection that otherwise occurs in transferring the conductive heat by phonons through the thin film to the surroundings.